It should be no surprise that when you shoot every day, like I do, that you miss stuff. But missing a magazine cover!? 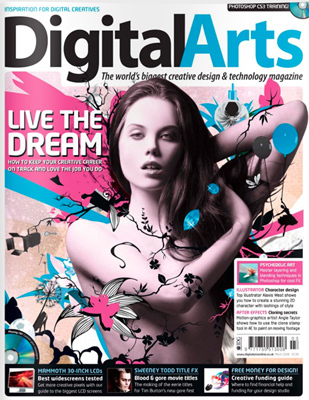 The Digital Arts cover is back from March of 2008. I probably heard something about it and just forgot it was coming out. I don’t own a copy! At least, I remember the shoot vividly. I shot it in collaboration with the cool graphic illustrators Vault49 (http://vault49.com) and originally the photo series showed as part of a different series. However, Digital Arts Magazine was doing a feature story on Vault49’s work and I guess it was re-run. The model is the hot Taylor Warren. She is an amazing model you have seen in countless magazines. I have photographed her several times and did some of her first shots when she was 14. The most notable shoot with Taylor was for the MTV show “How To Live Like a Model” (you can see the video in the video section on my website; http://michaelcreagh.com).